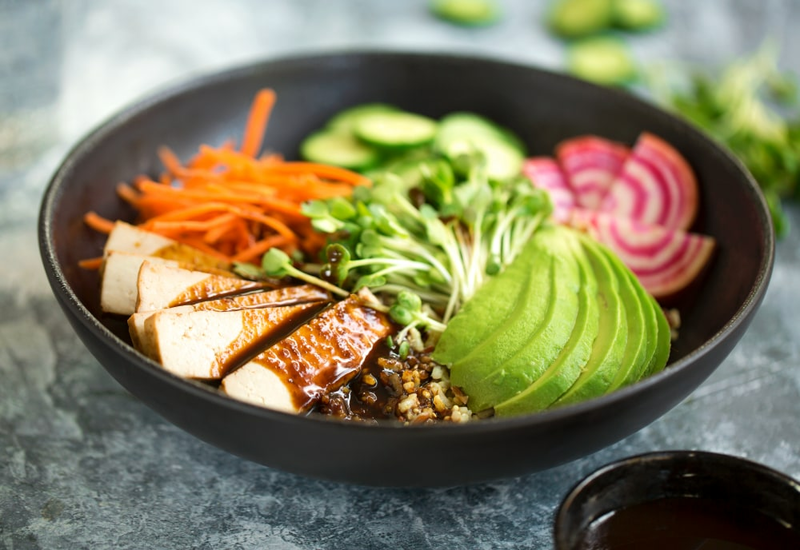 More than a mere rice bowl, this bountiful dish features tender mixed grains topped with tofu and an array of vegetables. A sultry, smoky sauce brings the perfect finish. The options are endless when it comes to complementary vegetable toppings, so don’t limit yourself to these suggestions only. Try combinations of crisp, raw vegetables like radishes, snap peas, and peppers with roasted Brussels sprouts, baked sweet potatoes, and grilled asparagus. Microgreens are a good replacement for radish sprouts. Per Serving: 416 calories; 18g fat; 56.9g carbohydrates; 12g protein; 1mg cholesterol; 1073mg sodium. This recipe was worth the work that went into it. I have been trying to eat less meat, and I don't miss the meat at all in this dish. Tons of flavor and still high in protein, loved it! I love the quinoa and wild rice combo, so nutritious! The smoky hoison sauce was also a winner, I will definitely be making this again. This is one of my favorite lunch meals, so good. I haven't played around with liquid smoke a lot, but I really like the flavor it gives to the sauce and tofu in this dish. I got a little creative with the add-ins and used Brussels sprouts and sweet potatoes. It turned out nicely. Really loved the idea for this bowl but I just can’t do tofu. I made it with shrimp instead and it was amazing. Loved everything about it including the sauce. This is a must try. Even if your not vegan, just make it your own using the proteins you love. I look forward to trying this! I am a bit disappointed that they don't have a recipe to make the smoky tofu? Or if they do, they don't appear to have a link? At any rate, this looks like it will be very tasty!